With SOLIDWORKS design, analysis, product data management, and technical communications solutions, JL Marine Systems has taken development of the Power-Pole shallow water anchor to a whole new level. John Oliverio’s passion for fishing combined with his engineering talent have transformed an idea for improving boat maneuverability into a world-class manufacturing company. Founder of JL Marine Systems, Inc., Oliverio conceived of the Power-Pole® shallow water anchor after recognizing how much valuable fishing time he spent trying to maneuver his boat into position before making a cast. Often, by the time he had the boat where he wanted it, the fish had moved. He thought there had to be a better way. At that moment, the Power-Pole was born. Today, Oliverio’s boat control technology has taken the bass fishing world by storm. Over 90 percent of the world’s best tournament anglers use the Power-Pole, because they understand how effective it is for controlling the boat and approaching cover, so they can make the perfect cast. The system’s popularity has enabled JL Marine Systems to grow and expand its reach, with over 1,000 distributors around the globe. Sustaining the company’s growth and advancing its product, however, required the manufacturer to replace the paper drawings it had used with a 3D development platform, according to Engineering Manager Amit Patel. “John understood that to take JL Marine Systems to the next level, we would need to leverage 3D design, simulation, and visualization technologies to accelerate time-to-market, improve product aesthetics, and control development costs. JL Marine Systems chose SOLIDWORKS Premium software because it is easy to use, includes integrated simulation tools, and provides enhanced visualization capabilities. The company added the SOLIDWORKS PDM Professional product data management and SOLIDWORKS Composer technical communications solutions. Using SOLIDWORKS design and analysis solutions, JL Marine Systems has improved the appearance and performance of the Power-Pole, shortened design cycles and time-to-market, and reduced prototyping and development costs. “SOLIDWORKS helps us design a cooler-looking product and add features a lot faster,” Patel stresses. “We’re at least 40 to 50 percent faster during the design cycle. Using SOLIDWORKS Simulation tools and 3D printing of rapid prototypes, we’ve also reduced prototyping costs by 50 to 60 percent. JL Marine Systems added the SOLIDWORKS PDM Professional system to increase the efficiency and improve the effectiveness of its internal processes. With PDM, Patel says the company can better manage revisions, automate workflows, execute design changes, and leverage design data for other functions. The company added SOLIDWORKS Composer software to improve the visual representation of its products for documentation and marketing purposes. For example, engineers can quickly create animations that show how to mount the Power-Pole to a boat or how to operate specific features. They also use the software to create high-quality renderings to support online and email marketing efforts. 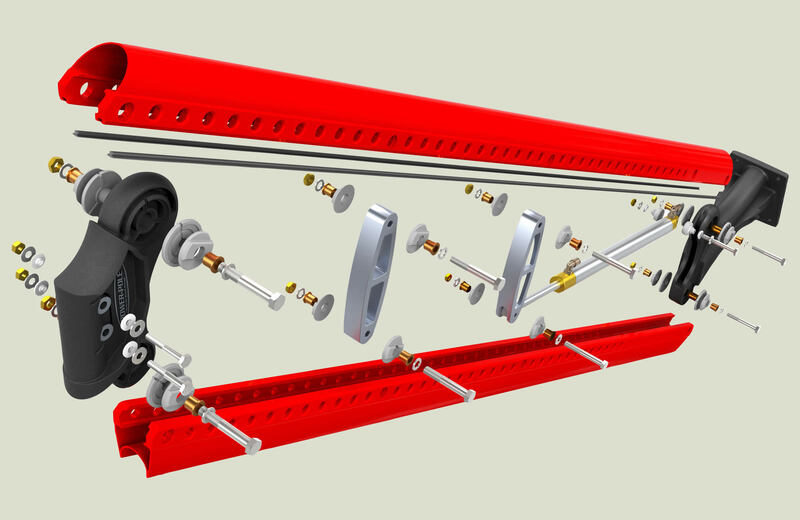 The PDM system efficiently manages all of the files and content related to a product, including visuals authored with SOLIDWORKS Composer software. Ramp up development and production of the Power-Pole shallow water anchor, a breakthrough boat control technology for sport fishing enthusiasts. . Implement integrated SOLIDWORKS solutions, including CAD design, SOLIDWORKS Simulation analysis, SOLIDWORKS PDM Professional product data management, and SOLIDWORKS Composer technical communications software.